Use the trampoline areas, dodgeball court, airbag and slam dunk zone. 60 min sessions start every half hour. UNLIMITED TUESDAYS Up to 5 hours fun for the price of an hour bounce every Tuesday in term time 16:00 - 21:00. FOR ANY ARRIVAL TIME buy an Unlimited Tuesdays Ticket then: Arrive when you Like! Bounce when you like! Take a break when you like! OPEN JUMP AfterDark - FRIDAYS 1900-2200 Party time with DJ and lights - celebrate the weekend After Dark!. 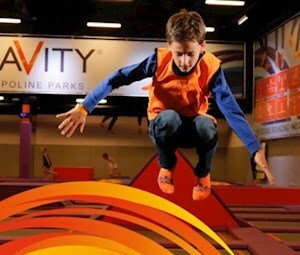 P&T Prices & ONE FREE PARENT per transaction in Off Peak Open Jump! Add total participants (toddlers + free parent + paying parents). Apply code P&T-5 before checkout for your parent-for-free discount. Toddlers must be over 18 mths, under 5 yrs & accompanied by an adult; each adult can accompany up to two toddlers. Not available for Unlimited Tuesdays. Online prices for OpenJump now 15% lower than walk-in - buy now to save £1.79 per ticket.